Mod: A great piece by award winning journalist Robert Parry that details how the NRA has distorted the true meaning of the 2nd Amendment. The consequences were seen once again this week, and will be again. The complete article is available at the link. How 2nd Amendment Distortions Kill (Consortium News link): Many politicians, especially those on the Right, pretend they are strictly adhering to the U.S. Constitution when they often are just making the founding document mean whatever they want – but perhaps nowhere is that as dangerous as with their make-believe Second Amendment. “Gun rights” advocates insist that pretty much any gun control violates the design of the Constitution’s Framers and thus can’t be enacted no matter how many innocent people die. Some on the Right, as well as some on the Left, even claim that the Founders, as revolutionaries themselves, wanted an armed population so the people could rebel against the Republic, which the U.S. Constitution created. But the Constitution’s Framers in 1787 and the authors of the Bill of Rights in the First Congress in 1789 had no such intent. Arguably other individuals disconnected from the drafting of those documents may have harbored such radical attitudes (at least rhetorically), but the authors didn’t. In fact, their intent was the opposite. The goal of the Second Amendment was to promote state militias for the maintenance of order at a time of political unrest, potential slave revolts and simmering hostilities with both European powers and Native Americans on the frontiers. Indeed, the amendment’s defined purpose was to achieve state “security” against disruptions to the country’s new republican form of government. In other words, if read in context, it’s clear that the Second Amendment was enacted so each state would have the specific right to form “a well-regulated militia” to maintain “security,” i.e., to put down armed disorder and protect its citizens. In the late Eighteenth Century, the meaning of “bearing” arms also referred to a citizen being part of a militia or army. It didn’t mean that an individual had the right to possess whatever number of high-capacity killing machines that he or she might want. Indeed, the most lethal weapon that early Americans owned was a slow-loading, single-fired musket or rifle. Further to the point, both the Constitution and the Bill of Rights were the work of the Federalists, who – at the time – counted James Madison among their ranks. And whatever one thinks about the Federalists, who often are criticized as elitists, they were the principal constitutional Framers and the leaders of the First Congress. They constituted the early national establishment, people such as George Washington, Alexander Hamilton, Gouverneur Morris and Madison. The Federalists feared that their new creation, a constitutional republic in an age of monarchies, was threatened by the potential for violent chaos, which is what European aristocrats predicted for the new United States. Democracy was a largely untested concept that was believed likely to fall victim to demagoguery and factionalism. So, the Framers sought a political system that reflected the will of the citizens (the House of Representatives) but within a framework that constrained public passions (the Senate and other checks and balances). In other words, the Constitution sought to channel political disputes into non-violent competition among various interests, not into armed rebellions against the government. The Framers also recognized how fragile the nation’s independence was and how domestic rebellions could be exploited by European powers. Indeed, one of the crises that led to the Constitutional Convention in the summer of 1787 was the inability of the old system under the Articles of Confederation to put down Shays’s Rebellion in western Massachusetts in 1786-87. Washington saw the possible hand of British agents. So, the Federalists were seeking a structure that would ensure “Domestic Tranquility,” as they explained in the Constitution’s Preamble. They did not want endless civil strife. The whole idea of the Constitution – with its mix of voting (at least by some white male citizens), elected and appointed representatives, and checks and balances – was to create a political structure that made violence unnecessary. So, it should be obvious even without knowing all the history that the Framers weren’t encouraging violent uprisings against the Republic that they were founding. To the contrary, they characterized violence against the constitutional system as “treason” in Article III, Section 3. They also committed the federal government to protect each state from “Domestic Violence,” in Article IV, Section 4. A grammar lesson for gun nuts: Second Amendment does not guarantee gun rights (Denver Post link): The Second Amendment is getting worked over again after the latest assault rifle massacre, and the usual suspects are issuing dire warnings that gun-control advocates want to undermine the constitution and take away freedoms and rights granted there. However, unless you believe that the Founders’ knowledge of grammar and sentence structure was suspect (and what right-thinking person would think that? ), the Second Amendment, though it does employ a peculiar and sometimes awkward construction called an “absolute,” is actually a very straightforward call for the establishment of an armed militia when necessary. It has nothing to do with individual gun “rights” except in that context. The main argument about the amendment has always been a semantic one: What is meant? What is the intention? I use the present tense, because grammatical deconstruction is done in the here and now. We are not trying to divine intentions from our personal beliefs of what the Founders “stood for” or what they “believed.” The Founders are dead, but their words remain alive in the present, and their words, as well as their meticulous grammatical construction, leave no doubt as to their intentions. In both cases, the initial dependent clause is not superfluous to the meaning of the entire sentence: it is integral. The team disbanded because the project was complete; the student was expelled because his offense called for stern discipline. This causal relationship cannot be ignored. Reading the Second Amendment as “A well-regulated militia being necessary to the security of a free state, the right to bear arms shall not be infringed,” clearly shows the same causal relationship as the example sentences; in this case, that the right to bear arms shall not be infringed because it is essential to maintaining a well-regulated militia. Thus, to call the first clause of the Second Amendment superfluous is to insult both Marshall and the framers. The “absolute” clause construction of the Second Amendment was quite common at the time, and appears in many state constitutions and framing documents. The primary purpose in these constructions is to give the conditions under which the rest of the sentence is true or valid. As a prime example of the ablative absolute, the first clause of the Second Amendment may stand grammatically free, but serves semantically to modify or clarify the meaning of the rest of the sentence. The Framers were clearly familiar with the ablative absolute and used it not as rhetorical fluff or flourish, but as a way of clarifying intent, in this case clarifying that the right to bear arms is granted in the context and within the scope of establishing a militia. Nothing more, nothing less. 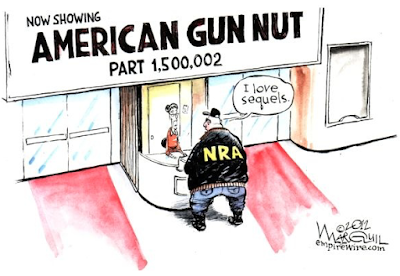 So today, when the paranoid fringe faction of the NRA howls that gun control is an assault on our Second Amendment rights, we might ask, which rights are those? Unless they mean the right to “bear arms” (itself a military phrase) in the service of a well-regulated militia, they’re just blowing smoke. The NRA is free to lobby all they want for the freedom for citizens to own whatever gun they choose — it’s their right. But to say that gun control somehow attenuates individual gun rights “guaranteed” by the Second Amendment, well, that’s just wrong. That guy likes his words, I had to stop reading, it was reminding me of many Sierra Madre Council meetings than just go on and on and on; snooze. I believe the word the author is searching for is Tyranny. One word and only one word, 2nd Amendment is the protection against Tyranny. The truth can be complex. Dummy talk like "the 2nd amendment protects us from tyranny, which is bullcrap, is simplistic. Maybe it hurt his feelings. Some of the previous comments explain how too many Americans justify their own gun "rights". These are most likely people who voted for trump, to keep abortion illegal and 2nd ammendment interpretation legal. I fear it will take a generation of educating these bible thumping sadly ignorant folks and their off spring to understand this great essay. Eye Roll head shaking, fast heart beat. If God has chosen to speak through Pat Robertson then we are all screwed. People of humans use what to kill other people or humans? Look what Donald Moron Trump and that nut case in North Korea almost did tt the rest of the world, I say Ban Trump for America's & the worlds health and safety first. So, you regulate guns: Hitler did that. No guns-what next? Ban knives? Cars?fertilizer? A screwdriver?acid? There are so many ways to maim! Criminals of any kind will find a way. I believe no one has a right “to have “ an AK47, or any rifle like that. I believe anything that makes a rifle into a repeater should be banned. Do you think all the murders in Chicago are done by law abiding, legal gun owners? I doubt it. Is Great Britain free of guns? Nope! There needs to be a debate for sure, but divisiveness and hateful remarks are not a debate! Are you proposing to regulate hateful remarks. So what do you do if people refuse to comply? Shoot them? I think 7:31 is suggesting that the Las Vegas mass murderer did it because his feelings were hurt. "I hate you I loathe you I despise you"
Will we be seeing you atop the Hotel Shirley any time today? 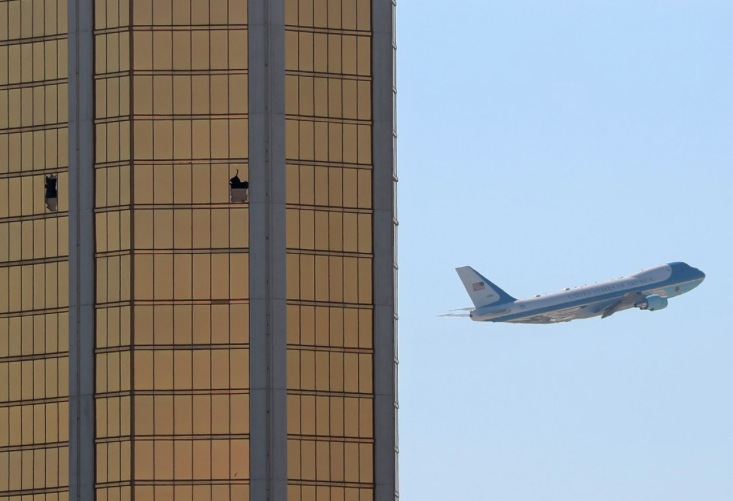 Did Trump go easy on the Las Vegas shooter by not calling him a terrorist? Honest- I wonder what 5:49 means by 'tyrrany'? On the surface, who wouldn't agree or even rally behind that novel idea from over 200 years ago? people now live in constant fear of other citizens' with assault rifles, or A-holes like Zimmerman who shoot kids and claim self defense then get away with it. That is the tyranny we face. The Republicans, that take millions from the death machine would like you to believe the funding from the NRA is from dues sent in by concerned citizens. That is a lie. The bulk of the group's money now comes in the form of contributions, grants royalty income, and advertising, originating from gun industry sources. We do not need some fool with military hardware to protect us from the tyranny of the Government. We need the Government to protect us from the "just happy normal recreational military death weapon aficionado"
The "Bump Stock" a non accessory item, will be address by a bi partisan Congress and the loophole will be closed. 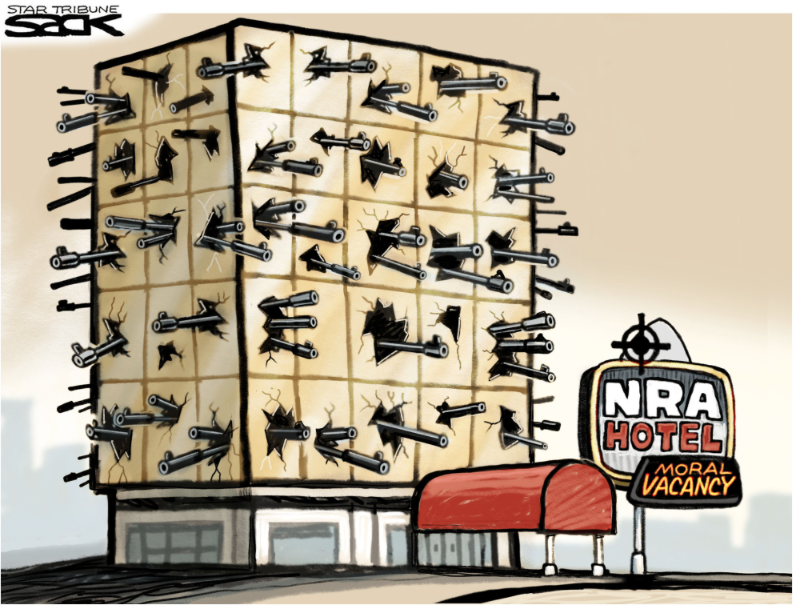 The GOP is addicted to NRA money. I doubt it will ever happen. It's a PR effort. Once people have begun to forget it will all vanish in a puff of smoke. What part of "the right of the people to keep and bear Arms, shall not be infringed" do you not understand? I understand it all. Including the part you're lying about. You're like the Christian who uses partial quotes,read the whole sentence. They are talking about a Well Regulated Militia not every nut that wants to kill people. Sshh! Don't disturb 9:14. I think he's channeling Pat Robertson. The Dems are addicted to donation dollars for each and every cause. You're right I doubt it will ever happen. The Las Vegas mass murderer was a Republican. Does that make him a Republican Terrorist? Fake news...please cite your source. His brother has been quoted as the shooter being non political...stop lying. He was a Ted Cruz supporter who later switched to Trump. So we can't keep illegal drugs or illegal aliens from freely crossing into the US, how do we keep illegal guns out of the hands of criminals? And for the wack job responses, don't get me wrong, I think use a gun in the commission of crime should be death penalty...solves a couple of problems at once. The only wack job here is you, gunsie. Mueller gets to the pee files. "Russia investigation now includes infamous Trump dossier"
WASHINGTON (Reuters) – The special counsel investigating whether Russia tried to sway the 2016 U.S. election has taken over FBI inquiries into a former British spy’s dossier of allegations of Russian financial and personal links to President Donald Trump’s campaign and associates, sources familiar with the inquiry told Reuters. Three sources with knowledge of Mueller’s probe said his investigators have assumed control of multiple inquiries into allegations by U.S. intelligence agencies that Russia interfered in the election to benefit Trump, a Republican. Shooting back at you idiot, what you go no answer for gunsie. You're shooting back at who? Someone shooting guns in Sierra Madre? Besides Detective Otis? Registered voters are turning away from the Republican Party and looking to the Democrats to solve America's issues like health care, according to a new poll. A Suffolk University/USA Today poll released Thursday shows that 62 percent of Americans now have an unfavorable view of the GOP, a 7-point jump in unpopularity for the party since the same poll in June. Just under half of Americans, 48 percent, feel the same way about the Democrats. When it comes to the president, more than half of Americans say Trump has not delivered on his promises. Nearly 57 percent of Americans say they want to see a Congress elected in 2018 who will stand up against Trump, while just 33 percent want Congress to cooperate with Trump and his legislative agenda. 9:45am. The Pulse Night Club murders happened under President Obama; and he did not ask Congress to ban Bump Stock hardware. The Muslim shooter, i'am not sure if I am Gay; so I'll kill people. Was it because President Obama couldn't say Radical Islamic Terrorist? 1) Bump Stock hardware was not used at the Pulse massacre. There were calls to increase gun control after that slaughter, something Obama supported and the GOP killed in exchange for NRA blood money. 2) You can say anything you like. Trump went to Las Vegas and said a lot of things. All of them about as meaningless as what you are babbling about here. 10:12 - if you want a machine gun join the Marines. You think joining the Marines is cowardly? And draft dodger Donald is a hero? 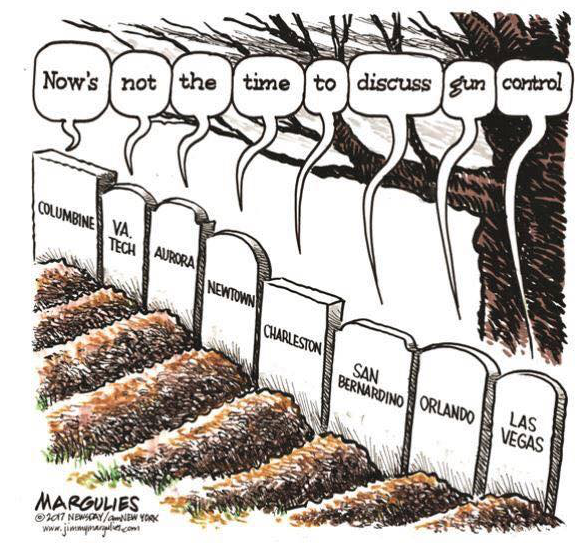 I'm just tired of "Now is not the time to discuss gun control" Let's look at this another way. If a virus popped up and made 400 people sick in 10 minutes, or a bridge collapsed injuring 400 people in 10 minutes, we would quickly get some very smart people together to discuss how to keep people safer. Why is this different? They said this after Sandy Hook and nothing ever happened, all those little kids dead and no change. People's priorities scare me sometimes. 10:19am. Now enlighten all of us on the never-ending guns and amo and killings in Chicago. All you have is tired old right wing talking points. It must be terribly lonely in your head. The Obama bump stock was approved under his ATF in 2010. Wikipedia: Gun violence in the United States results in tens of thousands of deaths and injuries annually. In 2013, there were 73,505 nonfatal firearm injuries (23.2 injuries per 100,000 U.S. citizens), and 33,636 deaths due to "injury by firearms" (10.6 deaths per 100,000 U.S. citizens). These deaths consisted of 11,208 homicides, 21,175 suicides, 505 deaths due to accidental or negligent discharge of a firearm, and 281 deaths due to firearms use with "undetermined intent". Of the 2,596,993 total deaths in the US in 2013, 1.3% were related to firearms. 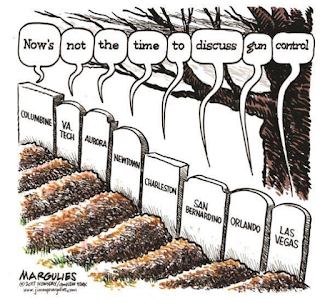 The ownership and control of guns are among the most widely debated issues in the country. 481 people dead from plastic bag ban. Because the homeless often use plastic bags as a disposable porta potty, the rise in hepatitis A continues. With a lack of sanitary condictions; simple soap and water would do the trick; people are dying. Just don't put one over your head. You'll be OK.
10:56am. Intelligent answer, and you wonder why the Legislative process takes years to change. There are still plenty of bags to go around. Governor Jerry Brown signed into Legislation; California is now a Sanctuary State. Does this translate into no required Jury Service? Laws protecting law breakers should be across the board. It's too bad we can't deport you for stupidity. Rep. Tim Murphy (R-Pa.), the embattled anti-abortion lawmaker who allegedly encouraged his lover to terminate a pregnancy, resigned from office Thursday just 24 hours after announcing his plan to retire after 2018. This afternoon I received a letter of resignation from Congressman Tim Murphy, effective October 21," Speaker Paul Ryan said in a statement. "It was Dr. Murphy's decision to move on to the next chapter of his life, and I support it." NRA is saying the group has no problem with banning the Bump Stock. Ok Congress; get to work. Wow. And all it took was 600 killed and wounded. 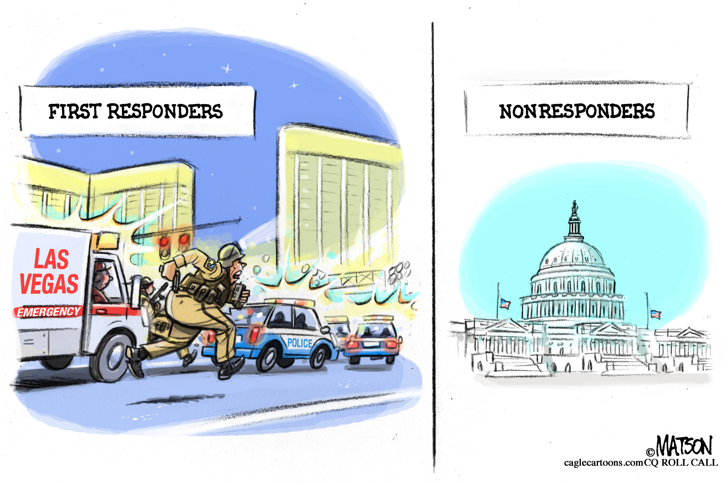 Congress needed to get the NRA's permission first. How will Tim Murphy vote? Let's see what else they try to tack on! Donald Trump Jr. did a little promo work for the NRA on gun silencers. Claimed the reason to do it was to protect his ears while he is killing cheetahs and rhinos. It is rather interesting how many columnists refer to the Constitution as a "living document" that needs to adapt to changes in society, yet they seem to focus on how the English language was structured at the time the Constitution was written and it must be interpreted that way to support their point. Can't have it both ways. Robert Parry tells us that the 2nd Amendment was written to provide individual states the ability to maintain a militia. What he doesn't want to point out is that a COUNTRY is considered a STATE, and that is why the leader of a country is referred to as a Head of STATE. Whether the authors of the Constitution meant the Federal state or individual states is a matter of subjective opinion. Remember when we were kids in school and the rule then was you don't end a sentence with a preposition and you don't split infinitives. The language has evolved. Mark Moe seems especially guilty of not understanding how languages morph over the years. He's caught up in sentence structure, but he doesn't anymore know what the authors meant than any of us. What we all know is that the term "well regulated" is contained in the 2nd Amendment, and there can't really be too much left to semantics to understand what that means. Only problem is that the pols ignore it. And because the phrase "the right of the people to keep and bear arms shall not be infringed" is in the 2nd Amendment, there exists a lifetime of job security for lawyers on both sides of the argument. There is a huge difference between "regulating" something and "infringing" it. Congress, if it had any common sense, could easily pass a law regulating private ownership of firearms to be something akin to the single-shot, muzzle loading long gun in vogue when the Constitution was written. Then again, you have to look back at the lack of concern about private ownership of guns after the Constitution was adopted and we officially had the US of A. In that context, it's difficult to reconcile the columnist's arguments since it wasn't an issue back then. It's the fact that the "well regulated" part isn't being used to full effect. Funny how strict Constitutionalist conservatives get all warm and squishy when it comes to their effing guns. Hopefully yours...so you go away! Wow. Must be a Republican. Independent... just like a good tune. Advocating the death of other peoples' children does not make you an independent. It makes you something disgusting and despicable. Would that also apply to free speech? It's not as if when the constitution was written they had any concept of talk radio or fauxnews, brietbart dot com. I think they would have had Bannon and Milo flogged. 3:44pm. First you have to assume everyone wiil follow the law! Private ownership, infringement? regulate? Are you going to bust down my front door so you can check? Thankfully living in a Democratic society protects me. Yes we are coming for you. OBEY follow the law. But seriously that is how society works we make laws and most citizens follow the laws. Some think they above the law for whatever reason they are called criminals. So DACA children are criminals in California but they are also living in Sanctuary? Why are gun nuts also bigots? Actually DACA is the law? Do you live in my country,or are you just stupid? 6:04 thinks that just because Trump says something it has to be true. Yepper, a complete and utter fool is amongst us. Libs think they only need to obey the laws they agree with. 1:21pm. Take the bag off your head and read the current news updates on hepatitis A; San Diego and Los Angeles county. 6:45 - be sure to take your medicine. Not everyone who gets hepatitis dies most don't please read the article. I stand corrected 17 have died. Certainly not 481. At least they admitted it. 6:08 pm. Why are nuts just that? repeat; why are nuts; nuts? I think the route to meaningful regulation of firearms is indeed to construe the 2nd Amendment as intended: it's about militias, not individuals. This does not mean that individuals have no right to own firearms however. The right to own firearms for self defense and hunting already existed for the colonists. The jurisprudence should therefore focus on those existing rights using a standard that considers the intentions of the framers, who could not have envisioned single persons wielding such destructive firepower. Since the rights existing in the 18th Century America were not unlimited, perhaps the analysis should begin with the 9th and 10th Amendments, which preserved rights not otherwise enumerated. 9th Amendment: The enumeration in the Constitution of certain rights shall not be construed to deny or disparage others retained by the people. 10th Amendment: The powers not delegated to the United States by the Constitution, nor prohibited by it to the states, are reserved to the states respectively, or to the people. Maybe President Trump will give them a roll of paper towels. I guess now 45 will be able to buy a gun without having a mental health check. Austin University Library Tower, three students killed after the gunman killed his wife and mother, 1966. The list is appalling. I thought those amendments protected "we the people" from the government, not the other way around.